When we asked whose responsibility it should be to protect the public from tainted dental work, the most common answer was “dentists.” However, some feel the FDA should enforce regulations, while others think the dental labs should police themselves. 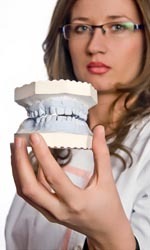 Very few respondents suggested that patients who are concerned should be responsible for checking with their dentists. We also asked respondents if the current fuss about possible lead contamination in dental crowns from China is the next big scandal or just a tempest in a teapot. One-third of dentists feels this will be the next big scandal, while the remaining two-thirds see it as nothing more than a tempest in a teapot. Finally, we asked dentists if they know where their lab work comes from. Sixty percent are certain that all restorations are manufactured within the USA, and another 20% believe that to be the case. Only 10% acknowledge that they know they use products made overseas.